We’re recruiting for a program director (also known as a health scientist administrator or program officer) to manage research grant, fellowship, training and other types of awards focused on the cellular and molecular mechanisms underlying inheritance, gene expression and development. The position is in our Division of Genetics and Developmental Biology, and it involves working collaboratively with other program directors in the division to support outstanding science in these fields. Candidates should have expertise in the use of state-of-the-art molecular genetics and/or genomics-based approaches to gain a mechanistic understanding of one or more of these, or related, areas: cell growth and differentiation, signaling pathway dynamics, DNA and RNA replication, DNA recombination and repair, transcription, the function of coding and noncoding RNA, RNA processing and protein synthesis. Familiarity with NIH extramural funding as an applicant, reviewer or NIH scientific administrator is a plus, and outstanding written and oral communication skills are essential. There are two vacancy announcements: one for candidates with current or former federal employment status and one for candidates without such status . Both announcements close on May 5, 2016. Please see the NIH HSA website for position requirements and application procedures. 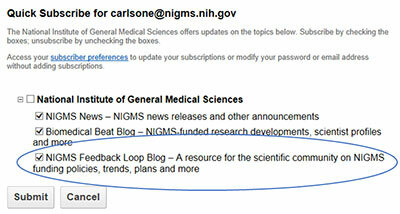 The Applying for Scientific Administration Jobs at NIGMS blog post offers additional background and tips. For more information about the position, contact David Wittenberg at 301-451-1828. Not looking for a position right now? Please help us out by forwarding this information to others who might be interested in this opportunity. We’ve been examining the benefits and challenges of team science and considering approaches to support this mode of research. We use a variety of mechanisms to fund collaborative and team-based science, including program project grants (P01s) and different types of center grants (e.g., P50s and U54s). At our recent Advisory Council meeting, we heard a report on P01 outcomes compared to those of other mechanisms. We also heard a report from an external review panel on the National Centers for Systems Biology program. To explore team science approaches, we have set up an internal NIGMS committee that includes representatives from across the Institute. Our goal is to develop better ways to identify and support research teams that will produce scientific advances not attainable by single individuals or by standard collaborative efforts. Management and advisory structures in team science. Past or current NIGMS team-based programs and funding mechanisms. RFI responses should be sent to TeamScience@mail.nih.gov by June 17, 2016. We also welcome comments here. As part of our program assessment process, we have analyzed NIGMS program project (P01) grants to improve our understanding of how their outcomes compare with those of other mechanisms. Do P01s achieve synergies above and beyond a collection of separate grants? How do the results from P01s compare with those from R01s? Do certain fields of science need P01s more than others? To address these questions, we analyzed the outcomes of P01 grants using several different metrics and compared these outcomes to those of two comparator groups: single-principal investigator (PI) R01s and multiple-PI R01s. Since P01s could be considered as a collection of single-PI R01s and one or more cores, we chose single-PI R01s as a comparator group. Because a major facet of P01s is their focus on using collaborative approaches to science, we also wanted to compare their outcomes to another collaboration-focused research grant: multiple-PI R01s. While structurally different from P01s, multiple-PI R01s allow for a comparison between two competing models of funding team science within the NIGMS portfolio. We have begun making grant awards resulting from responses to RFA-GM-16-002 (R35), the Maximizing Investigators’ Research Award (MIRA) pilot program. Out of the 179 applications we received, we have so far authorized 123 awards. The median yearly direct costs for these grants is $399,842, and the mean is $405,884. For comparison, the median yearly direct costs for an NIGMS R01 in Fiscal Year 2015 was $210,000, and the mean was $237,254. On average, the budgets of these MIRAs to established investigators were reduced by 12% relative to the investigators’ recent NIGMS funding history. As described in the funding opportunity announcement (FOA), the budget reductions were in exchange for the benefits of the program: a 5-year award instead of the standard 4-year one, increased flexibility to follow new research directions, increased funding stability and decreased administrative burden. We will use the funds freed up through this trade-off to support other investigators and improve the distribution of NIGMS funding. It will take time for the full benefits of the program to individual investigators and the research community to become clear. You can find more information about these awards on NIH RePORTER by entering RFA-GM-16-002 in the FOA field; however, the record of funded grants will not be complete until the end of Fiscal Year 2016. Because merging an investigator’s previous funding into a single award presents a variety of complications, in some cases the first-year budget of the MIRA is lower than the eventual funding level will be. This is frequently the case when the principal investigator (PI) was part of multi-PI grants that will be allowed to end before all NIGMS funding for the investigator is put on the MIRA or when the PI had already received funds from NIGMS in the current fiscal year. We will begin making awards for the new and early stage investigators MIRA (RFA-GM-16-003) after the May 19-20 meeting of the National Advisory General Medical Sciences Council. NIGMS is considering how best to support two important activities: the development of biomedical technologies and access to those technologies as they become research resources. These topics are closely related, but there are aspects of each that should be explored independently. Last summer, the Institute issued a request for information (RFI) on the support of biomedical technology development. The responses we received contributed significantly to initiatives for exploratory and focused technology development to be launched later this year. We now request your input in response to a new RFI on the need for and support of research resources (NOT-GM-16-103). The appropriateness and usefulness of existing research resources to the biomedical research community. Examples of unmet needs for research resources. The relative value of resources that serve many investigators versus specialized resources used by fewer investigators. The value and manner of coupling technology development to research resources. The review of research resource applications and the evaluation of funded projects. The role of academia, other biomedical institutions and industry in developing and providing access to research resources. The role of investigators and user fees in supporting institutional, regional and national resources. The role of NIGMS in supporting research resources and technology development at various levels. We also welcome any other comments that you feel are relevant to supporting research resources. To respond to this RFI, send an email to nigmsresource@mail.nih.gov by June 3, 2016. If you have any questions about the RFI, please let us know. We’re looking for multiple program directors (also known as program officers or health scientist administrators) to manage research grants, undergraduate and/or graduate student research and postdoctoral career development programs, and capacity-building programs. Several of the positions are in the Undergraduate and Predoctoral Training Branch of our Division of Training, Workforce Development, and Diversity (TWD). These individuals will manage undergraduate and/or graduate student development programs along with research and training grants. Another position is in TWD’s Postdoctoral Training Branch. This individual will manage one or more of the programs in this branch along with research and training grants. We’re particularly interested in candidates who have broad expertise in areas relevant to the NIGMS mission and professional experience in the training of research scientists as well as in programs aimed at increasing the diversity of the scientific workforce. The other position is in our Center for Research Capacity Building. This individual will manage programs that support research and provide resources for research infrastructure enhancement and capacity building in the basic, translational and clinical biomedical sciences. These programs seek to enhance the competitiveness and diversity of the biomedical research workforce. Please see the vacancy announcement for position descriptions and requirements and detailed application procedures. The positions close on April 13.